Edward Snowden, the National Security Agency whistleblower, has called on the digital and developer communities to protect people's privacy in the absence of government legislation. 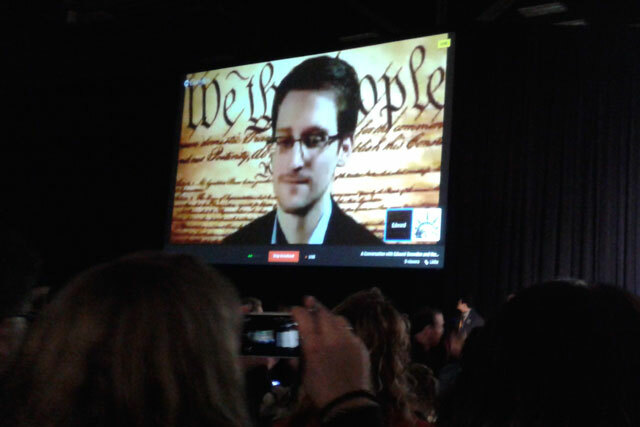 At the South by Southwest festival yesterday, Snowden appeared in front of an image of the US constitution via a video link that was run through seven proxy servers, in order to protect the secrecy of his location, which resulted in poor visual and audio quality. Snowden said: "The NSA is a global issue. They are setting fire to the future of the internet. It's the maker community who can create solutions to make us safe." In addition to discussing different types of encryption, Snowden said that the key to security on the internet was to make it more expensive for the government to collect people's data. The privacy activist Christopher Soghoian, who was on stage during the talk, expanded on Snowden’s point. He said: "The goal is not to blind the NSA – the goal is to stop the government spying on innocent people just because they can. If you make it too expensive, the government will need a genuine reason to spy on a person." Soghoian added that more people should consider paying to use browsers and other tools, because ad-supported businesses, like Google, are not built to protect people's privacy. He said: "If you want a secure service, you're going to have to pay for it." In the Q&A portion of the talk, the creator of the world-wide web, Sir Tim Berners Lee, sent a message thanking Snowden for acting in the public interest as the latter appeared through a video. Answering a question about how satisfied he felt about the debate he had created, Snowden said he leaked information about the NSA because it violated the US Constitution. Snowden said: "I took an oath to support the constitution and saw it being violated. The interpretation of the constitution had been changed in secret, from no unreasonable searches and seizures to seizures being okay, just no searches." In response to another question, about why it was okay for companies to collect individual data and not governments, Snowden said it was because the government had the ability to deprive people of things, and were often beyond the challenge of the courts. When asked if big data could be used for positive outcomes, Snowden said the bottom line was that "data should not be clandestinely collected".